So the current total number of PE’s dedicated for VPN functionality is around 400 (2 PE’s in each POP x 200). A full iBGP mesh between 400 PE’s comes around 79,800 sessions ((400×399) /2). By introducing two VPN RR’s each PE will have only two iBGP sessions with each of the VPN RR’s and each RR will have 400 iBGP sessions with each PE. So this solved the full iBGP mesh problem. Now the next problem is how do we solve sub-optimaltiy, path-diversity (for multipathing and fast-recovery) with the introduction of RR’s. Luckily, this is pretty simple to solve with VPN’s Routes and thanks to Route Distinguishers (RD’s). ACME decided to use different RD’s for the same customer which made the vpnv4 routes unique. Hence VPNv4 RR’s reflects doesn’t hide the path as they don’t look same to the VPNv4 RR. If we look at an example below, the Customer is advertising the same Prefix “P” to both PE’s. Since we are adding separate Route Distinguishers to the same prefix “P”, it results into two different VPNv4 Routes.From a RR perspective, they are two different routes and hence it reflects both routes to the other VPNv4 clients. This is a pretty well known and simple way to achieve path-diversity and mitigate sub-optimality. One other feature ACME is looking into is BGP Route target constraint RFC, i.e. RFC 4684 to gain efficiencies on the PE side, but this is slightly off topic so I will leave this as an exercise for the reader. We could potentially apply the similar concept on Internet traffic like we did for VPN traffic to overcome the challenges posed by RR’s if we placed the Internet traffic within a VRF (lets call it Internet VRF). But unfortunately ACME doesn’t put its Internet traffic within a VRF. So lets explore some other ideas. As you saw earlier that the location of RR’s becomes very important to avoid sub-optimal routing. So ACME decided to put a RR pair in each POP. Since RR’s are co-located with RR clients within the POP, RR’s best path selection should be the same as those made by POP clients from an IGP cost perspective. This way ACME avoided sub-optimality at the Intra-POP level as the IGP distance to BGP Next-Hop will not play a big factor now. But this created another problem as you may already know that all top-level RR’s need be fully meshed together which created its own scalability issues. There are 400 RR’s (200 POPs x 2 RR each POP) brings the iBGP mesh to 79,800 sessions. This brings back to the problem where we started initially, i.e. large number of iBGP sessions. So ACME decided to introduce a 2nd level hierarchy of RR ‘s. ACME grouped POPs into three main geographical regions West, Central and East Coast. RR’s in the POPs are RR clients to the regional RR’s (2nd level hierarchy). Top level RR’s are fully meshed each other. In the below fig. 8 (A) West coast POP has two RR’s (within POP) and they are peering with their 2nd level regional RR’s (West). There is also an iBGP connection between 1st level RR’s within the POP. Fig.8 (B) shows a high level picture of the 1st level RR’s in each POP peering with their 2nd level RR’s which are fully meshed together. So by putting RR’s in each POP solved the sub-optimality problem at the Intra-POP level and putting regional RR’s at 2nd level solved the full iBGP mesh problem between 1st level RR’s. Reflect the routes learned from 2nd level RR’s and advertise towards the RR clients. Since the clients within the POP are fully-meshed there is no value of RR reflecting the routes within the POP (Intra). 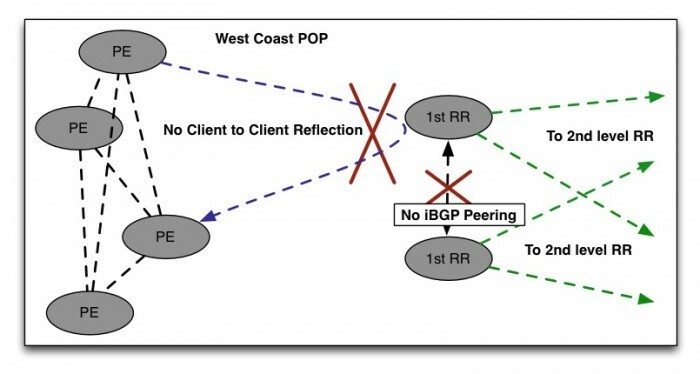 Hence at that point we will disable Client-to-Client reflection (“no bgp client-to-client reflection”) within the POP. Also at this point, creating an iBGP mesh between 1st level RR’s within the POP adds no value so they will not be connected to each other. One thing to observe here is if we increase the number of PE’s to 10 or whatever number in each POP or increase the number of POPs, this design will handle the growth. Okay, So far so good, but what about solving sub-optimality and path diversity for Inter-POP traffic? Plus adding a 2nd level of RR hierarchy may further reduce the path diversity. In order to solve Inter-POP suboptimality and path-diversity issues between POPs, ACME looked into BGP Add-Path(https://tools.ietf.org/html/draft-ietf-idr-add-paths-10) which enjoys support from various vendors. BGP Add-Path is very similar in concept of adding unique RD for VPNv4 Routes. It adds a unique Path ID to the Prefix to make Prefixes look different for instance, a Prefix 10/8 learned from two different disjoint next-hops can be identified as (10/8, ID =1) and (10/8, ID=2). In order to have BGP Add-Path functionality it requires the software upgrade on BGP RR and RR Clients. Luckily, all the routers running BGP in ACME network had the latest software which supports this capability. Also, there is another solution called BGP diverse-path (Shadow RR’s) which allows to solve the similar problem without any need to upgrade the BGP RR clients, but the problem there is that it’s only supported by one Vendor (at least for now). Hence this solution was not considered. As we know that there is no free lunch, cost for using BGP Add-Path which may vary based on the mode used. The cost is more on memory (adj-rib-ins) caused because of additional paths and control plane stress over iBGP sessions caused due to reflecting additional path BGP updates which may re-trigger BGP decision process more often. 1) Avoid MED oscillations — Yes, as no paths are hidden from any BGP Router. 2) Helps in achieving Hot Potato Routing — Yes, as the RR propagates all the paths to their clients, RR Clients gets visibility to all the paths and can pick the optimal (hot potato) path w.r.t their own IGP distance. 3) Convergence — Yes, Since all the paths are known by a BGP router, post convergence path following an IGP event or BGP next hop router failure has been already available that will perform rerouting w.r.t this event. The biggest drawback of this method is that all paths are stored by all routers which is very expensive from a memory perspective. For instance a path to prefix P is advertised by N BGP border routers, with a full mesh iBGP sessions, a BGP Router will store N paths in its Adj-RIB-In. If an Add-ALL-Paths along with Route Reflection is used, then each client is connected to 2 RR’s, it will learn upto 2xN paths as both RR’s will send the full set of available paths. Hence the BGP router will store 2xN paths in its Adj-RIB-IN’s which is worse by orders of 2 than having a full iBGP mesh. The main objective of this mode is to avoid MED oscillations.The idea of this mode is to let BGP routers advertise over iBGP the best path that they know for each neighboring AS. 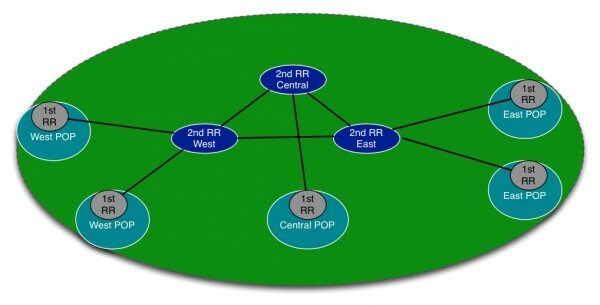 As a result, the lowest-MED paths from each neighboring AS are known to all BGP routers, hence non-lowest MED paths cannot be picked as best, guaranteeing convergence. Regarding fast recovery (convergence) and load balancing, Add-Group-Best-Paths provides one path for each neighboring AS, but not necessarily the post-convergence ones or the optimal ones. The group best is the set of paths are the best paths from the paths of the same AS. For instance, let’s say there are three AS: 100,200 and 300. Prefix P11, P12, and P13 are learned from AS 100; P21, P22, and P23 are learned from AS200 and P31, P32, and P33 are learned from AS300. When we run BGP best path algorithm on the paths from each AS, the algorithm will select a best path from each set of paths from that AS. Assuming p11 is the best from AS100, p21 is the best from AS200, and p31 is the best from AS300, then the group-best is the set of P11, P21, and P31. In this mode RR only propagate N paths to the clients. N paths are calculated by the RR by first computing the best path, removes all the paths including the best path with the same next hop as the best path, then computes the second best path by running best path computation on remaining paths, and repeats this process until the resulting set becomes empty or the N paths have been selected. 2) Helps in achieving Hot Potato Routing: It doesn’t guarantee that, but if N is very high, then possibility of achieving optimal hot potato routing increases. 3) Convergence: Maybe. It doesn’t learn all the alternate paths, it doesn’t guarantee that post convergence path will be known to the router. Even though this mode doesn’t guarantee above aspects theoretically, but practically chances of achieving Hot Potato Routing and convergence are pretty high with high value of N (Juniper supports maximum 6 paths). Also, this mode is a lot more deterministic for an NSP to predict increases in memory and control plane stress with N paths. ACME decided to implement Add-N-Path and was enabled on 1st and 2nd level RR’s with the value of N to 4. Having 4 paths (if available) for a prefix was enough for achieving fast-recovery and Hot Potato routing. Please recall that this is only for inter-POP traffic, for Intra-POP traffic we have full iBGP mesh between the PEs. BGP Best External is complimentary to add-path in situations where the routing policy causes a border router to prefer a prefix “P” learned over an iBGP session than eBGP session (situations like Active-Backup topology). For instance in Fig. PE1 and PE2 are learning a Prefix “P” and advertising them to the RR. PE1 is preferred over PE2 which is accomplished by increasing the Local-Pref to 300. RR propagates the Route learned from PE1 to PE2. 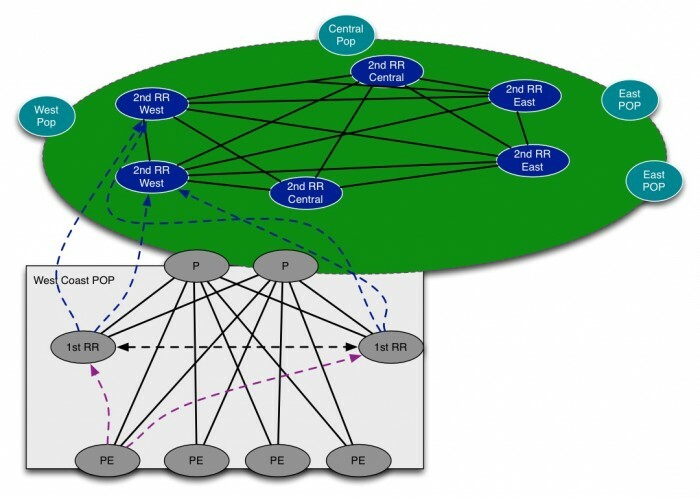 PE2 prefers router PE1 over its eBGP neighbor. RR learns only path, i.e. from PE1. So even if RR is enabled for Add-Path, it won’t be able to reflect both paths to PE3. Since PE3 is learning single prefix we can’t achieve fast convergence (BGP PIC edge), multipathing. With Best External enabled, PE2 will be still advertising its route to RR even though that’s not the best path. So we looked at how we can scale RR design in a large scale network and still achieve Hot Potato (Optimal Routing) and BGP Fast recovery. This is something we can do today. Recently, many vendors have released support for their OS in virtual form factor. This facilitates an environment where pure Control Plane functions (out of band RR) can be run over VM’s with more compute power available. This has opened up opportunities for ideas like RR’s running SPF from a Client perspective and calculating the best path to the BGP Next Hop and sending that BGP best path to the client. In the case of multiple areas, BGP -LS can be leveraged to export the IGP view of another area to the RR. 1) Would it be possible to link back and forth to 1 and 2 in each blog post? 2) in section 2 part 1, your assumption is next hop self to the RR, which would almost never happen (for many reasons). The next hop should always be the egress PE. This will make hot potato realistic. 3) in section 10 part 2, putting that many RRs in is not realistic. At all. 2 or 3 RRs would be perfect for this size set up. You could argue for 3 geos and then hierarchical at the top running those. But certainly not hundreds. Recommendations to expand – PIC Edge, role of BFD, IGP and the role it plays. Overall, great to see articles like this. Congrats! Tony , thanks for the comments . Please see my response inline. [Diptanshu] Section 2 (RR design Part 1) is just introductory part. I am sure, I am probably missing the right section which you are referring to. Nevertheless, I don’t think I am referring anywhere to have the RR setting itself as a next-hop as that would not be a good idea 🙂 . I have seen a need for setting next-hop self on RR during Inter-AS Option C or in Unified MPLS (but that’s a tangent). I am assuming that PE’s are setting themselves as next-hop while advertising external prefixes in the internal mesh. RR’s (1st and 2nd level) are just reflecting the routes. So an ingress PE has the information about Egress PE next-hop for any external prefixes. [Diptanshu] So I knew that this question would be coming while I was writing 🙂 and was debating whether to use a global network or just re-use my MPLS-TE ACME network and i choose to be lazy here :). I think I should have taken an example of a global network spanning across all (almost) continents than just the USA and may be that would have been little more realistic than just using the USA as an example. Though there is only handful of networks (NSP’s and Content Providers) of this size but that’s aside the topic. My main point of ADD-ALL-PATH compared to other ADD-Path modes is that it’s worse (at least twice) than an iBGP mesh. In a normal case with full iBGP mesh if a Router is learning ‘N’ prefixes, then with 2 RR’s + BGP Add-ALL-PATH it will be learning ‘2xN’ prefixes. It obviously depends on the value of N and depending on the state and scale of a network this may be problematic or not. Let’s assume that a network which has high degree of peering and is learning same 200,000 prefixes from 10 Ingress points which makes it to 2 million prefixes. With a full iBGP mesh we are looking at 2 million prefixes. With 2 RR + Add All paths we are looking at 4 million prefixes. If all my PE’s are Mx960, CRS, ASR9k not a problem (I wish). But if I have also lower end PE’s like Mx80’s then I am pushing my PE capability towards the edge with 4 million prefixes. Sure, we can always through Memory and CPU at the problem, but that may not always be the best way to solve the problem. Now if I have ADD-N-Path with a value of N= 4, then with 2RR+Add Path i am looking at 1.6 million ( 2x(200,000 x 4)) prefixes and my Mx80 will do just fine from a RIB perspective. That’s why I feel, ADD-N-PATH is a better fit for achieving Hot Potato Routing compared to ADD-ALL-PATH as it provides a better control on the number of prefixes one want to leak. (Not Considering GROUP-BEST as it was designed to solve MED oscillation not Hot Potato routing). On RR’s cost part, No doubt that running 400 “dedicated” hardware RR’s would be very expensive. But the way i see RR’s is that its a pure control plane function which could be run on VM’s and don’t need to be run on dedicated hardware. Running Juniper VMX’s, IOS XRv or CSR as RR’s on a server should be a lot cheaper than on a hardware platform. Though you may still have the operational headache. [Diptanshu] Thanks for the suggestion.I will keep these in my mind while writing my next topic. “BGP—Selective Route Download” feature on the RRs. Yupp agreed . I think its always a good idea to have “BGP-Selective Route Download” on out of band RR’s. Thank You for sharing your knowledge and taking time to write this insightful blog! Great Post!!! Today i learned something new before going to bed!! makes my day complete, thanks to you. Would you spend some time explaining BGP PIC – I am finding it difficult to conceptualise hierarchical FIB ans how convergence time will actually be reduced to 50 – 200 ms.